Publisher: Vincent Stuart, London, 1954. First edition. Condition: Hardcover, with dust jacket wrapped in plastic. Near fine. Small creases to dust jacket, small bookseller’s sticker to corner of endpaper, slight tanning. Scarce, especially in this condition. 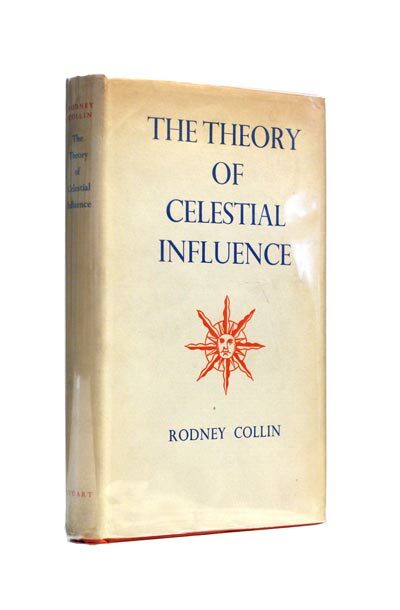 Rodney Collin (26 April 1909 – 3 May 1956) was a British writer in the area of spiritual development. His work was heavily influenced by his teacher P. D. Ouspensky and, through him, G. I. Gurdjieff and their system of spiritual development. Collin was one of the most well known of Ouspenky’s students and a prolific writer. He met Ouspensky in 1936. “Rodney Collin immediately recognised that he had found what he had been searching for in his reading and travels. 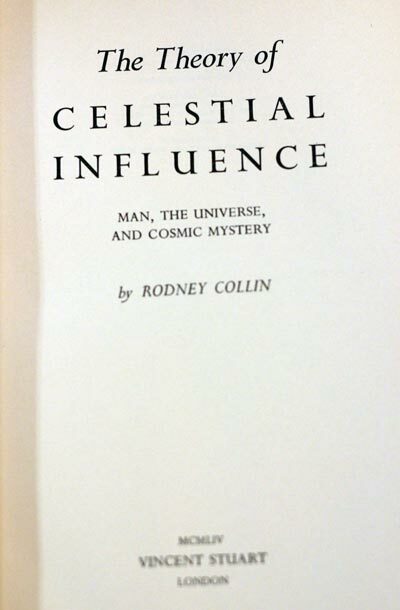 From then on he dedicated all his time to the study of Mr Ouspensky’s teaching.” Collin’s best known work, The Theory of Celestial Influence, is an ambitious attempt to unite astronomy, physics, chemistry, human physiology and world history with his own version of planetary influences. Schools of the fourth way have existed and exist, just as schools of the three traditional ways existed and exist. But they are much more difficult to detect, because – unlike the others – they cannot be recognized by any one practice, one method, one task, or one name. They are always inventing new methods, new practices, suitable to the time and conditions in which they exist, and when they have achieved one task which was set them they pass on to another, often changing their name and whole appearance in the process. Collin studied the sequence of European civilizations, finding a pattern which would follow a planetary scale where the times are 10 times longer than in the case of human life. His sequence starts following Toynbee’s but soon he changes some aspects, trying to follow his said pattern. Thus, his list begins with the Greeks (with roots on the Egyptian, which he considers the last one in the previous sequence), then the Romans, the Primitive Christians, the Monastic Christians, the Medieval Christians, the Renaissance and the Synthetic. He also quotes the influence of an extra-European civilization, the Arabic, upon the Medieval Christian civilization. Thus schools of the fourth way were undoubtedly behind the designing and construction of the great Gothic cathedrals, though they had no special name and adapted themselves to the religious organization of the time. For a time the Cluniacs sheltered them, for a time the Freemasons. In the seventeenth century, similar schools were responsible for much of the new scientific and medical research, sometimes under one name and sometimes under another. In the eighteenth century again, fourth way schools borrowed many of the discoveries of Greek and Egyptian archeology to clothe their ideas and their organization, while some of their leaders – in order to penetrate the luxury-loving and sophisticated circles where they had work to do – might even appear in the guise of fashionable magicians or mesmerists. The conceptual foundations for this project are the Law of Three, arguably similar to the triad of Thesis, antithesis, synthesis of Georg Wilhelm Friedrich Hegel, and the Law of Seven, the idea that the notes of the Western musical scale encode universal stages in essentially all developmental processes. Collin unites both of these schemata geometrically using the enneagram figure. Collin’s other work includes The Theory of Eternal Life, which uses some of the ideas of The Theory of Celestial Influence as a point of departure to formulate a theory of the cycles and potentials of souls, e.g. reincarnation. His works The Theory of Conscious Harmony and The Mirror of Light are more spiritual explorations of humanity: faith, acceptance and forgiveness in contrast to the philosophical scope of his earlier works. Collin spent the last years of his life in Central and South America, where he anticipated a new world might emerge. He hoped to be an agent of that new world. He studied the Meso-American cultures and sought to tie their wisdom to Fourth Way principles. His endeavor, however, was cut short with his unexpected death by falling off the bell tower of the Cathedral of Santo Domingo, Cusco while having a heart attack. A memorial plaque for Rodney Collin is now placed by the bell tower at the Plaza de Armas.